Vegetables are at the heart of southern Italian cooking. Every summer in Puglia, I walk past the many local traders on my daily walk to the beach, who sell fresh vegetables out the back of their fiat panda or on the side of the road on a fold out table. Everything from root veggies, large foliage greens, bright coloured peppers, sweet smelling tomatoes, fat deep purple aubergines and so much more, all grown on their local land. These veggies are organic as organic can be and at prices you could only wish to find in your local supermarket here in the UK. Its not a surprise that vegetables are such a key part of their Pugliese diet. 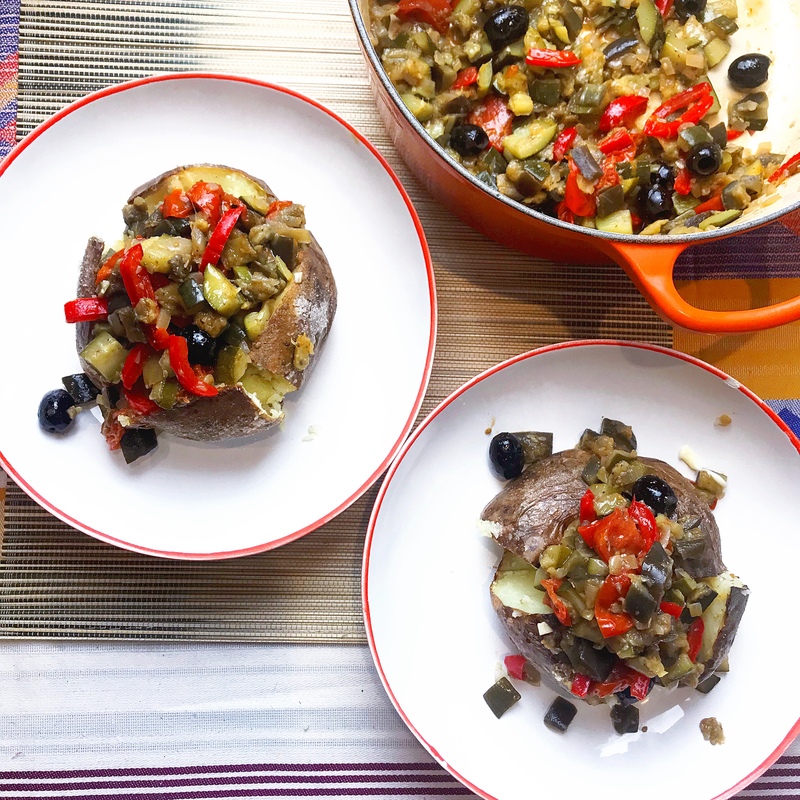 A great example of such cooking is ‘Caponata’ a beautiful collection of summer vegetables delicately combined together with dry oregano, a drop of acidity and a handful of olives. This dish is so versatile. It can be served as an antipasti dish, served on the side to complement a lovely slice of pan fried white fish or make it the hero of your dish. I recently discovered that serving this with a crunchy skinned jacket potato is a totally winning combination. Perfect cooking for vegetarian week. First, drizzle and heat some olive oil in a pan. Fry the garlic in olive oil on a low/medium heat until softened. Add the courgettes and cook for a couple of minutes. Then add the aubergine and cook for a five minutes. Add the pepper. Cook all the vegetables until they have softened. When the vegetables have cooked, take the pan off the heat. Add the olives, oregano, salt and a few drops of wine vinegar. Allow the dish to reach to room temperature before serving.